Auckland Talking to union members, organizers, and activists in New Zealand, one thing many of them mentioned as a bright, shining spot has been the progress of the Living Wage Movement throughout the country. The national mandatory minimum wage is $16.50 NZ per hour, and the living wage number this fall is going to be more than four NZ dollars higher around $20.50 NZ. In US dollars that would be a current minimum of $10.84 compared to $7.25 per hour as the federal minimum in America, and $13.46 compared to the $15 per hour that has been the campaigning point for many in the states. It’s not hard to see how a campaign like this would start to make a huge difference, especially to lower waged workers, just as the living wage movement has delivered in other countries. Living wage standards are different than in the US version, because they are voluntary, rather than mandatory. In the US, where achieved, a “living wage” victory sets a new hard floor for all workers in a jurisdiction, either corporate, public employers, or contracted workers for public authorities. Labor unions have been most aggressive in joining with community partners in the US to force living wage levels for subcontractors as a hedge against subcontracting by eliminating the incentive for public employers to join the race to the bottom so common in the modern economy. The Living Wage Campaign in New Zealand has been more along the lines of the effort developed in the United Kingdom by UK Citizens. Employers are both targeted by the campaign and solicited broadly to voluntarily join the campaign and become “accredited” as “living wage employers.” They receive a certificate that can be posted, and they are allowed to advertise the fact that the pay the living wage minimum. There is no governmental enforcement mechanism for scofflaws, but in talking to a union organizer, not surprisingly many unions have used that fact as an organizing tool to encourage workers to join the union in order to enforce that way and generally improve wages and working conditions. At this point there are about 100 employers that have agreed to the standard covering an estimated 1000 workers throughout the country. Many of the early employers were nonprofits, charities, and religious organizations, but even more significantly the campaign has succeeded in bringing on public employers in several jurisdictions including Christchurch and other larger city councils. At the end of 2017 a national utility company, Vector, agreed to the standards which was a major breakthrough as the first large private sector company. The national government, a Labor-Green coalition, is reportedly coming on board soon which will encourage more public employers on the local level to join the new standard as well. Since the agreement covers contractors, this should be a boon for labor organizing to see that it gets done and stays intact. Over the next year some believe the standards may cover 5000 workers. Many believe that these earlier successes of the campaign are helping solidify the potential for community-labor coalitions and could be one of many factors reenergizing the New Zealand labor movement. 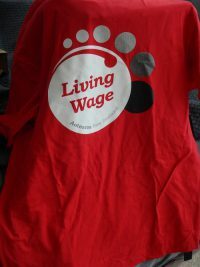 This entry was posted in ACORN, ACORN International, Citizen Wealth, Financial Justice and tagged Living Wage, New Zealand by Wade. Bookmark the permalink.